Venice resident Stephanie Deiter has been hosting a cookie exchange for almost 20 years. Stephanie Deiter, right, and longtime cookie exchange participant Tari Kelly, left. Is there anything more festive than a holiday cookie exchange? Stephanie Deiter, director of human resources at the Venice YMCA, would say no. Every year, Deiter bakes six dozen cookies and decorates her Venice home for her annual holiday cookie exchange, which she’s been hosting for almost 20 years. She sends her husband and son out to do their holiday shopping and gathers a group of girlfriends, who have been attending the exchange since its inception. What began as a casual gathering has turned into what the group considers a can’t-miss holiday party—one that’s fueled by both sugar and friendship. Deiter’s exchange usually happens the Thursday before Christmas, so the cookies will be fresh for the holiday. As guests arrive, dressed in their festive best, their trays of cookies are laid out on a table along with holiday punches, hors d’oeuvres and wine. After an evening of eating, drinking and catching up, everyone fills her empty tray with a pile of cookies, resulting in a gorgeous array that you’d be hard-pressed to find at any grocery store or bakery. The opportunity to connect with dear friends is a big draw, too, of course. “I look forward to the cookie exchange every year; it allows me to touch base with wonderful friends that I don’t get a chance to see throughout the year,” says longtime participant Tari Kelly, an Ohio native who says she’s become known as the “Buckeye girl” thanks to her homemade chocolate-and-peanut-butter buckeye cookies. Deiter says there are few rules about what people can bring. “I just ask everyone to bring about six dozen cookies and the recipe, if they want to share it,” she says. And while she says that some guests fret about bringing enough cookies or choosing the perfect recipe, when it comes down to it, it’s not really about the cookies. In the bowl of a stand mixer, fitted with the paddle attachment, beat the butter on medium low speed for 1 minute. Add the sugar and beat on medium speed for 4-5 minutes or until light and fluffy. Beat in the eggs, one at a time, scraping the sides as needed. With the mixer on low, beat in the vanilla and almond extracts until just incorporated. In a large bowl, whisk together the flour, salt, baking powder, baking soda and cream of tartar. With the mixer on medium low, gradually beat in the dry ingredients, mixing until just incorporated. Portion out the dough with a small cookie scoop (the two-teaspoon size). Place no more than eight on a cookie sheet, as they will spread a bit. Flatten with the smooth bottom of a glass (using flour if needed to avoid sticking). 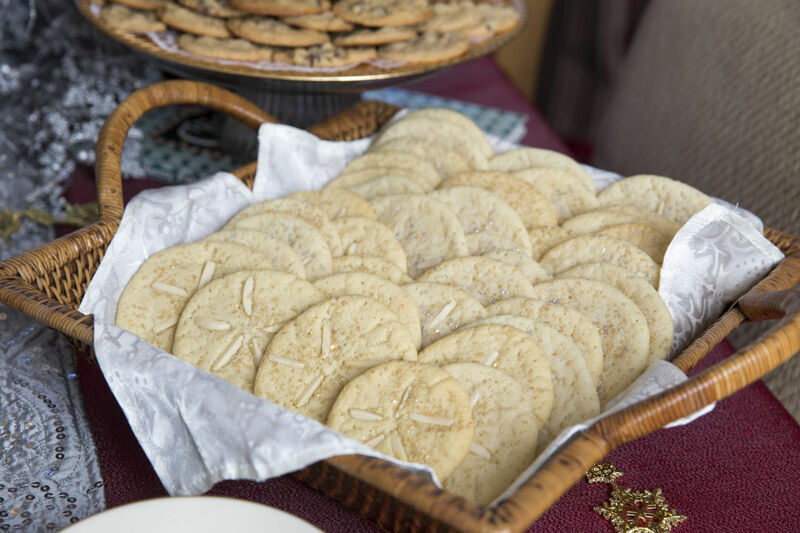 Press almond slivers on cookie center in the shape of a star (five pieces) and sprinkle lightly with cupcake gems. Bake for approximately 8 minutes. Allow to cool for a few minutes before removing from tray. In large bowl, cut butter into flour until fine crumbs form. In small bowl, with fork, mix sour cream and egg yolk. Stir sour cream mixture into flour mixture just until blended and dough comes away from side of bowl (dough will be sticky). Cover dough with plastic wrap and freeze for 1 hour. In a small bowl, combine sugar, walnuts and cinnamon. Sprinkle 2-3 tablespoons of the cinnamon mixture onto the rolled mixture and press in lightly. Using a pastry wheel or pizza cutter, cut dough into approximately 16 equal wedges. Starting at curved edge, roll each one into a jelly roll shape. Place point side down, about 1 ½ inches apart, on an ungreased cookie sheet. Repeat with remaining dough, one fifth at a time. Preheat oven to 350 degrees. Bake cookies 20 minutes or until golden. Sprinkle with confectioner’s sugar just before serving. Get in the spirit. Deiter goes all out decorating her Christmas tree and sets a festive table, complete with candy, hot appetizers and colorful punches. Pick a date that’s close to the holidays. Deiter holds her cookie exchange a few days before Christmas, so cookies will be fresh for dinner or can be easily frozen. Make sure that each guest makes enough cookies for everyone. At Deiter’s exchange, that means everyone brings about six dozen cookies. Don’t worry about making complicated cookies. “Everyone loves traditional cookies,” Deiter says. She makes horns “that look fancy but are easy.” Others make family recipes; one woman brings banana bread every year. Deiter says the main goal is to have fun.